Summary: On a very windy day, the wind blows Mr. White's umbrella, Priscilla's balloon, the twins' scarves, even the wig on the judge's head. The wind seems to have a mind of its own! Each week I read the poem on the handwriting page. I ask my daughters to listen for words that start with the /w/ sound. Sometimes I have them do an action, like stand or put their finger on their nose if they hear the secret sound of the week. Next we make the letter in the air with our fingers. The next day I’ll pull out this sheet again and we will read the poem and look at the words while reading. Then I ask if they can spot any of the secret letters in the poem. We use a highlighter to mark them. After that, my daughters color the sheet and practice writing at least one letter. For letter identification practice, we played an Egg Carton Smash game. The girls enjoyed being told to smash the correct letter! Who is this kid? Yes, this is my son, several years ago. For some reason I am lacking pictures of my girls blowing bubbles. 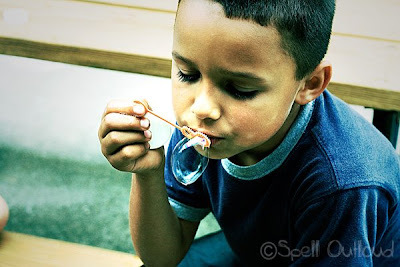 Bubbles are a great way to show young children that the wind can blow in different directions. Each day go out and blow bubbles. Which way are they blowing? Did they blow the same direction yesterday? How far did they go? Brainstorm different things the wind can blow. Can it blow a leaf? a kite? a house? (not normally) a feather? What do they notice about the things the wind can blow? (they are light-weight). 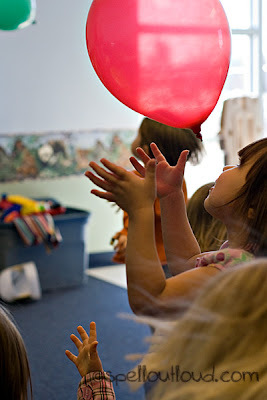 Try keeping a balloon up in the air by blowing it. Can you blow it across the room? 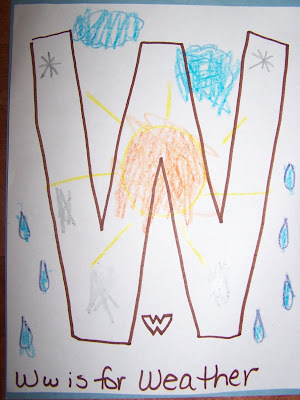 Shannon, a former Tot Team member, came up with several weather ideas to go along with the letter W. This would be a perfectl way to talk about different types of weather and even chart the weather for a week. I printed off this W for wind for Ben.. He is 5 and is needing lots of practice with writing his letters. Oh how I enjoyed seeing the marshmallows with the letters written on them.. Cute idea..